A simple 360° video or photo creates a certain “wow” effect especially for new users. If they also interact with your virtual reality content, for example by intuitively entering new rooms, they truly immerse themselves and start living your experience! Surely quite costly to implement, isn’t it? Our team has set itself the task of reinforcing this “wow” effect through user interaction. We have defined numerous standard elements (the so-called hotspots) in our editor, which can be intuitively operated and configured with just a few clicks. They form the core of the mobfish VR STUDIO and your Virtual Reality App! How exactly do hotspots work in the virtual reality environment? Hotspots within a VR scene can be positioned to appear floating in space or located on things within the scene. 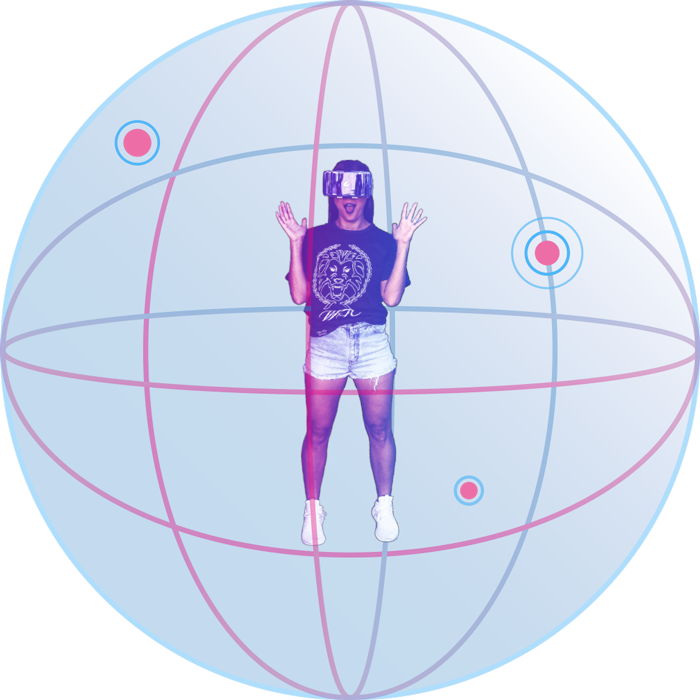 These hotspots are actually placed inside spheres and can have different distances to the user. As a rule, they are indicated by small icons so that the user can ultimately recognise them, but transparent hotspots are also possible! Let’s get to the elements that make your VR idea a unique experience. Various interactive elements combine to make your VR product a true experience! With scene links you can connect different scenes with each other. For example, you can easily create a virtual tour or a walk-through. Want to give your user a short piece of information about one or more objects in the room? Via the text hotspot, you can add “virtual buttons” to these objects. The text appears at the push of a button. It’s not all about a 360° approach! With image hotspots it is possible to display 2D images within the scene. Users can easily open and close them. Do you have a very specific story to tell alongside a picture? Then simply add an audio file to the picture. It will play when you open it! Video hotspots work in the same way as image hotspots. So you can show videos to users, even with cinematic dimensions! A video like that has a completely different effect, doesn’t it? Audio hotspots are a powerful tool! Activated by various triggers, they can play music, provide the user with precise information through spoken texts or skilfully direct the user’s gaze – always following the sound. The provision of important external sources or information can easily be implemented by means of web links. Simply enter the target URL and lead the user to the additional resources. This exits the Virtual Reality application. Question, answer! Gamification is the correct term here. Challenge your users by asking a question with the Quiz Hotspot, blocking the way until the question is answered correctly! Organise your scenes as a menu and guide the user to the right content. Fixed layouts and sophisticated design ensure that menu items are displayed clearly. Not enough? Our team is constantly developing new hotspots and features. Naturally, we place a great focus on what will help you best. So get in touch and let us know what you still need to create your VR App.